This book is very different than what I had envisioned by its title. I assumed it would just be a litany of German World War II awards with a list of the recipients, and maybe some short bios of some of the different awardees. This book is much more than that. In this book, you will not find aces or Uboat commanders. It is strictly about German field commanders. Some of the names will be familiar to some, and some will not. Keitel, Halder, and Runstedt's careers are described in the book. It also shows the decorations they were awarded, and for what reasons they became bemedaled. The careers of Herbert Gille, Hans Hube, and Martin Grase are also shown to the reader. A chapter is also dedicated to the Spanish commanders of the 250th Infanterie Division. As to be expected, the Knights Cross (Ritterkreuz) and its variants (oak leaves, swords, and diamonds in order of rank), are detailed in the commanders' lives. The German Cross in Gold, and when its recipients received it, is also delved into. If you are looking for a list of the different World War II German medals and their recipients, look elsewhere. If you are looking for short biographies of German Army and SS, mostly Army/Heer and the late war time period and the medals awarded them, then look no further. The book is also illustrated with many actual examples of the various awards' written certificates. The authors have liberally supplied the book with pictures of the awarded men. Most of the pictures are formal portraits of the officers, and many are of them receiving their awards from Hitler. Nine German Army commanders were awarded the highest (at the time) version of the Knights Cross with diamonds, along with two SS commanders. For 40 bucks I will skip this one and read about them online. BTW, the book's title is very confusing as to the subject matter. Not a good publishing technique. 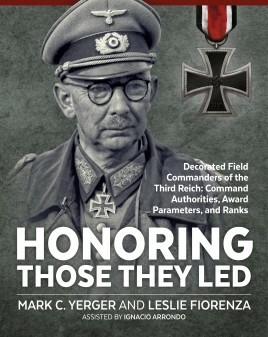 "Honoring Those They Led" sounds like the book is about enlisted men and junior officers.